The first book you read in a year is an important decision for this bookworm. I feel it sets the mood for my entire reading year. The Readers of Broken Wheel Recommend by Swedish author Katarina Bivald is the first book I’ve read on 2016. I couldn’t have chosen a more perfect title to start my reading year. It was all that I expected it to be. It didn’t disappoint me and it left me with a smile on my face. It left me feeling like it’s going to be a good reading year. The Readers of Broken Wheel Recommend is the story about Broken Wheel, an almost abandoned town in Iowa and how the power of books can transform a society. The Readers of Broken Wheel Recommend is also the story of Amy and Sara. Amy, an elderly resident of the town of Broken Wheel, Iowa, and Sarah, a young woman from Sweden, are pen pals that form a lovely friendship through handwritten letters and exchanging books. After two years of correspondence, Amy invites Sara to visit her so they can finally meet in person. However, when Sara arrives, she finds out her beloved friend is dead but is quickly adopted by the people and the town of Broken Wheel. Sara’s arrival to Broken Wheel is not inconsequential; as it brings the little almost dead town and its people back to life. 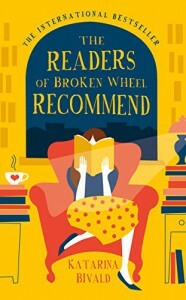 The Readers of Broken Wheel Recommend is a book for bookish people. Whether you call yourself a bookworm, book lover, avid reader, etc., this book is full of references, quotes and bookish facts and humor that you will highlight and keep in your bookish heart forever. SPOILER ALERT, I must say the book has a lot of references to other books, which will be spoiled for you if you haven’t read them! It also poses a lot of bookish questions and interesting answers for them. Questions like: are people better than books? If you were a book character would you be a main one or a minor one? Do you judge books or people without knowing them? Have you ever smelled a book? (Tell me you pictured Rory smelling a book after reading that question!) And a lot more interesting questions of the sort that will leave your bookish mind thinking of your answers to them. If you’re looking for a book about how books can transform lives, this is the book for you. If you’re looking for a book about friendship, family, and love, this is the book for you. If you’re looking for a book with romantic love stories and adorable heartwarming stories about small-town people, this is the book for you. If you’re looking for a story about a little town and how everyone in town comes together for common good, this is the book for you. If you are a bookworm, this is the book for you. The Readers of Broken Wheel Recommend has it all and like the quote above says, it is a book for every person. I’m glad I read it. Giveaway, Full review and other musings on my blog.